(Phys.org) —Do relatively non-invasive research methods like flash photography harm or change the behaviour of the very creature being investigated? It's an ethical dilemma frequently faced by environmental scientists, but newly published research from UTS shows that, for one seahorse species at least, the news is good. Like many fishes, seahorses can have individual markings that can be used to identify them. As the accessibility of underwater digital photography grows, scientists are investigating the possibility of using underwater flash photography as an alternative to tagging for long-term ecological studies. "We don't believe tagging has long term effects on seahorses however there is potential for using photography as an alternate method to prevent having to catch individuals," said marine scientist and UTS School of the Environment PhD candidate David Harasti. Harasti is the lead author of a paper published in the Journal of Fish Biology that addresses, for the first time, the impact of underwater flash photography on seahorses. "Some seahorses have spots and blotches that are easily identified, especially when flash photography is used, but there haven't been any studies to determine the impact this might have on seahorse behaviour and movements" said Harasti. Seahorses have an advanced eye structure – they need good eyesight to capture tiny fast-moving prey in often murky conditions – and as a precautionary measure in 2011 the flash photography of seahorses was banned in the United Kingdom by the UK Marine Mangement Organisation. "We thought this intriguing. Seahorses are iconic species, scuba divers love photographing them and since future data collection may come to rely on using underwater flash photography we felt it important to assess the potential impacts," said Mr Harasti. Using adult White's seahorse, Hippocampus whitei, from a pool of previously tagged individuals from the Port Stephens Great Lakes Marine Park, underwater experiments using a combination of handling and flash photography were conducted over 12 months. 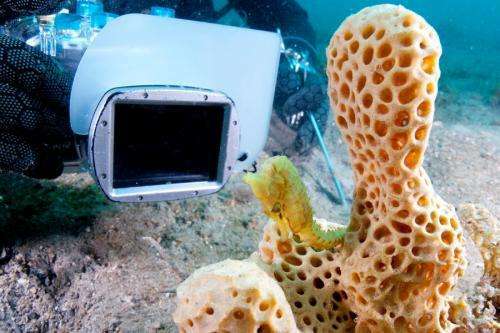 Co-author of the paper UTS marine biologist Professor Bill Gladstone said the study showed that flash photography had no significant effect on the behaviour, movement or site persistence of White's seahorse. "Handling the seahorses did lead to some short term behaviour changes. They tended to seek shelter or change their holdfast so, for scientific purposes, the least invasive method would be to not handle the fish," Prof Gladstone said. Harasti believes that although studies on other seahorse species are needed, this research demonstrates that flash photography could be safely used in seahorse studies. "This is good news because there is significant potential for citizen scientists to share their photographs with researchers and provide valuable information about the distribution, habitat use and behaviour of these amazing marine creatures." The website www.iseahorse.org has been established to encourage divers to submit images of seahorses to assist scientists in learning more about them.